Herbal support for loose stools, squits and irratable bowel syndrome (IBS). Fast acting, combination of botanical extracts. Liquid for ease of administration. 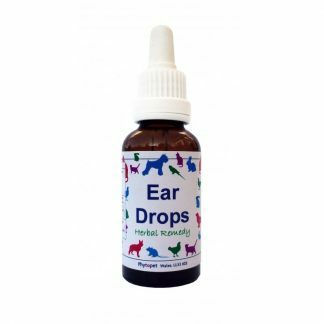 No fighting to give tablets, just add drops to water, food or treat. 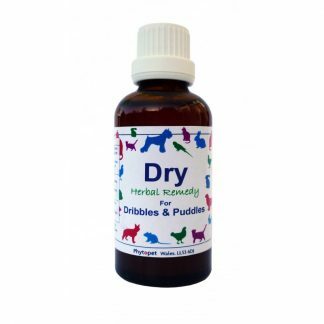 Dry 2 is safe to use on puppies, etc. Phytopet Dry 2, contains a combination of liquid botanical extracts to help with loose runny stools and upset stomach. A traditional remedy for urinary tract and bowel disorders, its antiseptic, diuretic and astringent properties makes Shepherds Purse a must in any incontinence and diarrhoea mix. Herbal specific for incontinence, frequency, enuresis and haematuria (blood in urine). Also due to its astringent properties, very useful for the squits. Its actions are styptic, haemostatic, astringent. A good astringent with a traditional use for incontinence and squits. One of the modern herbalist most effective tools for irritable bowel syndrome (IBS). Useful in a broad spectrum of bacterial, fungal and parasitic infections. Shown to sooth and tone mucus membranes. 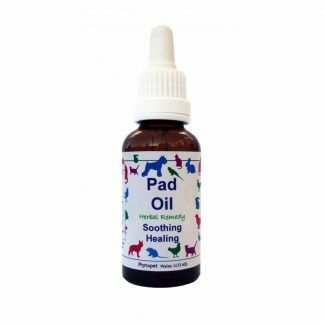 Specific for ‘the squits’ especially infectious; and urinary tract infections such as cystitis. Used in both western and eastern herbal medicine. Renowned for its astringent and properties. Traditionally used for digestive problems, specific for dysentery and diarrhoea. Oak combined with which hazel makes an excellent night time wash to help with broken capillaries. Also useful for treating haemorrhoids. A well known digestive tonic. Used by travellers for settling upset tummies. Specific for ‘Deli-Belly’ due to its anti-microbial, calming action on the digestive tract. Cinnamon’s warming, astringent properties make it useful when treating stomach upsets. Widely used in Ayurvedic medicine for digestive disorders. Stop food, give plenty of water and electrolytes. Carob powder or slippery elm powder mixed into water. Repopulate gut with good bacteria, small amounts initially and increase dose as diarrhoea reduces. If diarrhoea has not cleared up in three days, or your pet slips in and out of consciousness, or shows signs of dehydration you must seek professional veterinary advice immediately.